When you make meals and snacks that use recyclable materials, you may simply toss the materials into your recycling bin. However, you can also use the recyclable materials to create a whimsical craft that your children can play with, such as a bumble bee toy. Making a bumble bee out of recyclables is an activity that your children will enjoy, as well as learn from as they discover how they can reuse recyclable materials to turn them into new items. Cut a piece of bubble wrap to measure 6 inches wide, 8 inches long. Set it aside. Paint yellow and black stripes on the outside of a plastic water bottle using acrylic paints. Allow the paint to dry for 30 minutes. Place the bubble wrap rectangle against one side of the bottle, and wrap twine around the bubble wrap to secure it to the bottle. Allow the short ends of the bubble wrap to stick out on either side of the bottle. 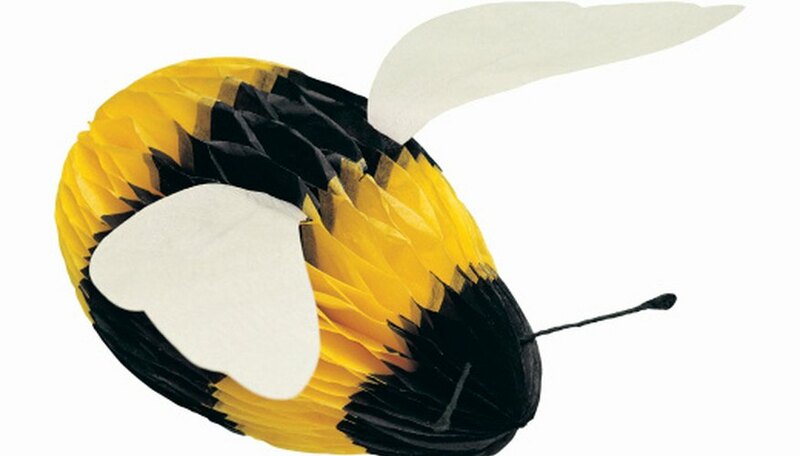 These will be the bumble bee's wings. Apply two pea-sized dollops of tacky glue onto one end of the bottle, and press two googly eyes onto the glue dollops. These will be the bumble bee's eyes. Allow the glue to dry for 20 minutes. Bend a black chenille stick in the middle. Squeeze a pea-sized dollop of tacky glue above the googly eyes, and press the bent chenille stick onto the glue. Position the ends of the chenille stick so that they stick upward. These will be the bumble bee's antenna. Let the glue dry for 20 minutes before displaying the recycled bumble bee.